An order of the Russian Government has this week lifted last month’s total ban on grain exports, but stopped well short of Prime Minister Vladimir Putin’s forecast that significant export shipments of Russian grain may be allowed later in the season. Putin said on Tuesday that Russia retains the capacity to continue exporting grain, once the uncertainties over how much this year’s harvest will bring in, and how much has been planted for the next harvest, have been resolved. In a meeting with workers of Norilsk Nickel, the country’s largest mining company, Putin said that this season’s drought-hit harvest is likely to come in at 60 million tonnes; that is down 30% from last year. For confidence in meeting domestic consumption and fodder requirements, he noted that 78 million tonnes are required. The current grain export ban is in effect from August 15 to December 31, and applies to both unmilled grain and flour. However, an amendment introduced this week – reported by a government news agency, but not yet published — allows shipments of grain for humanitarian aid, if Russia has signed aid treaties with recipient countries. Smaller volumes of grain are also allowed for shipment to Russian diplomatic, technical or military missions abroad. Russia is the third largest grain exporter in the world, trailing Canada and the US, but ahead of both in the Egyptian market — until this season’s weather catastrophe. Because Putin announced the ban on August 5, but it did not take effect until August 15, Russian traders rushed to ship as much grain as they could in the 9-day interval. Russian Customs figures, just released, show that from August 1 to 14, 1.6 million tonnes of grain (mostly wheat, and a little barley) were loaded and shipped; this volume compares to just 749,000 tonnes shipped in the same period of 2009. Altogether, from July 1, when the new shipment season commenced, until the ban took effect, Russia exported 3.6 million tonnes — that is 1.5 million tonnes more than last year. For the season to June 30, 2011, the Grain Union says it had been planning to ship 24 million tonnes, but that was before the July heatwave struck, and before drought restricted planting of the new season’s crops, especially in southwestern Russia. Still, industry sources in Moscow are speculating that the humanitarian aid proviso may be a loophole to allow up to 3 million tonnes of grain exports to be shipped before the ban reaches its deadline — and at substantially higher price and cost to the state budget than prevailed before the ban was introduced. Alexei Bezborodov, a leading shipping analyst in Moscow, told Fairplay: “Russia sends humanitarian aid to Cuba, North Korea, possibly Vietnam and Yemen. I believe the OZK [United Grain Company] will apply for exports to Egypt, too.” OZK is the newly established state grain trading organization, with the ambition to compete against rival state or producer marketers in the global trade such as the Canadian Wheat Board and the Australian Wheat Board. Dmitry Teibash, OZK’s spokesman, was asked how long he expects the Russian export ban to remain in place. “I’d rather not give any forecast — it’s the government’s task,” he replied. He was unavailable to answer a follow-up question regarding OZK’s plans to ship cargoes of humanitarian wheat, or their destinations. 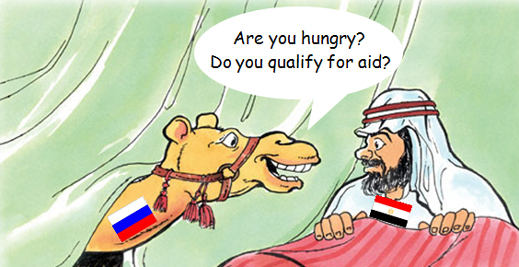 * Ancient Arabian proverb — If the camel once gets his nose in the tent, his body will soon follow.